Probably not Lego but I wouldn't mind figuring out how to power them. I think these are the ones where you need a power pack that contains the batteries. Each powers up as you join them together. Is that Lite Brix (my apologies to the English language)? I just bought a lot of used Lego and it had a bunch of these mixed in. They are much lower quality than the Lego bricks and they have a battery powered base. Honestly I didn't even test then, just binned them all before my kids saw them and demanded to keep them. Certainly looks like Lite Brix. If you find one of the power supply bases they can make some pretty cool looking stuff. I keep them separate from Lego, but they don't get tossed out because my wife likes that they light up. Looking at a battery pack on evilbay,it does seem that the connector will work. I bought a couple cheap light up sets at DG,but they have little watch batteries in them and you only get 2,usually a white light and one that just flashes blue and red. These will be neat to try out anyway,battery pack is only $12. Hold up, those are Laser Pegs, not Lite Brix. 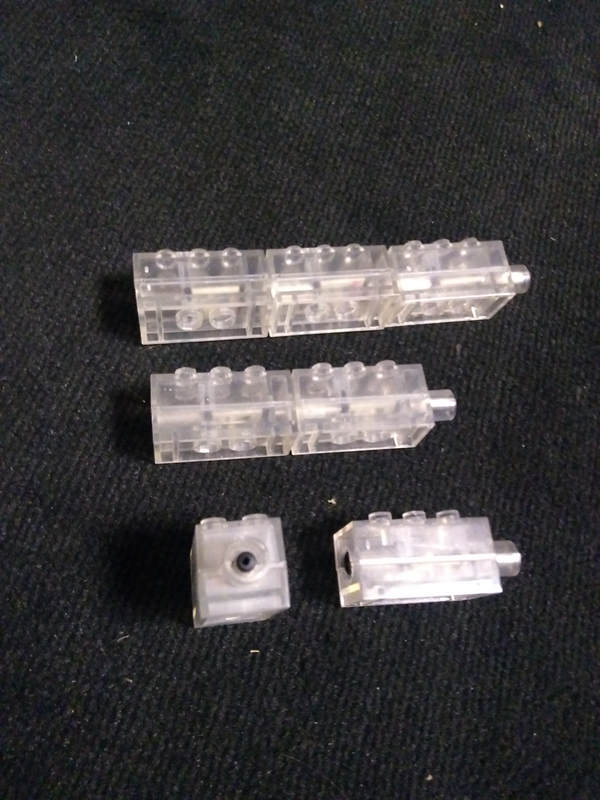 My apologies for the prior post, I have both of these and they are definitely different connectors.